Myxomycetes are a class of Amoebozoa of which only few practical applications are published in literature. This article reports the first results towards the use of selected slime mould species as antagonist in agricultural applications. Antagonists in this context are organisms used to control plant pathogens, protecting the plant host against invasion by e.g. bacteria and fungi. Mycotoxigenic fungi from the Genera Fusarium, Aspergillus, Penicillium and Alternaria as well as selected plant pathogenic bacteria were used in the tests. competition for feed such as plant pollen and anthers which are required nutrient sources for specific plant pathogens (e.g. Fusarium species) during plant infection. 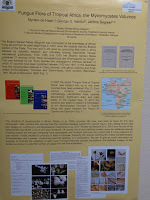 Fungus Flora of Tropical Africa, the Myxomycetes Volumes. / de Haan, Myriam; Ndiritu, George G.; Degreef, Jérôme .Abstract book the 9th International Congress on the Systematics and Ecology of Myxomycetes, Tanabe, Japan, 18-23 August 2017. 2017. 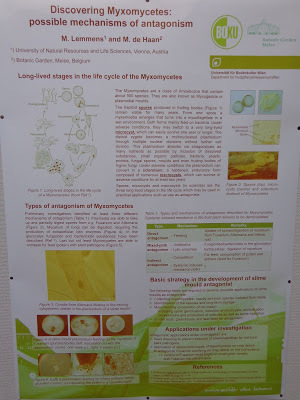 Mayotte, additions to the tropical Myxomycetes of France. / de Haan, Myriam; Seraoui, El-Hacène; Pélissier, Maurice; Buyck, Bart.abstract book the 9th International Congress on the Systematics and Ecology of Myxomycetes, Tanabe, Japan, 18-23 August 2017. 2017. 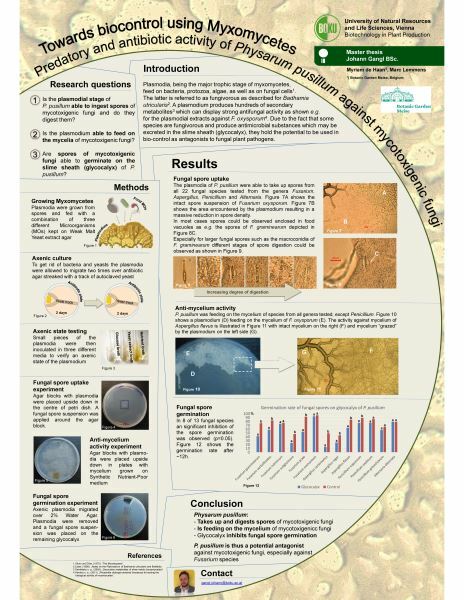 Towards bio-control using Myxomycetes: predatory activity of the myxomycetes Physarum polycephalum and P. pusillum against mycotoxigenic fungi. / Gangl, Johann; de Haan, Myriam; Lemmens, Marc.Abstract book the 9th International Congress on the Systematics and Ecology of Myxomycetes, Tanabe, Japan, 18-23 August 2017. 2017. 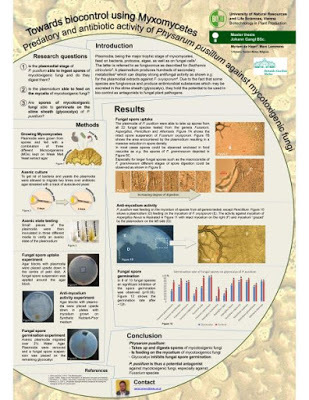 Towards bio-control using Myxomycetes: identification and isolation of slime moulds from maize. / Jabbarimalayeri, H.; de Haan, Myriam; Maloku, Imer; Lemmens, Marc.Abstract book the 9th International Congress on the Systematics and Ecology of Myxomycetes, Tanabe, Japan, 18-23 August 2017. 2017. Discovering Myxomycetes: towards applications for bio-control. / Lemmens, Marc; de Haan, Myriam.abstract book the 9th International Congress on the Systematics and Ecology of Myxomycetes, Tanabe, Japan, 18-23 August 2017. 2017. Scientific user requirements for a herbarium data portal. / Vissers, Jorick; Bosch, Frederik Van den; Bogaerts, Ann; Cocquyt, Christine; Degreef, Jérôme; Diagre, Denis; Haan, Myriam De; Smedt, Sofie De; Engledow, Henry; Ertz, Damien; Fabri, Régine; Godefroid, Sandrine; Hanquart, Nicole; Mergen, Patricia; Ronse, Anne; Sosef, Marc; Stévart, Tariq; Stoffelen, Piet; Vanderhoeven, Sonia; Groom, Quentin.In: PhytoKeys, Vol. 78, 24.03.2017, p. 37-57.